Home > Skin Supplements > Why is Dandelion a Natural Diuretic? The name in Old French means “tooth of a lion” (dent de lion). One contemporary French name is pissenlit (or piss-in-the-bed), because it acts as a natural diuretic, helping rid the kidneys of excess water and salt. But no matter what name you choose to give the versatile dandelion plant, one thing is clear: it's one of the safest and most popular herbal remedies around. The dandelion, both its flowers and leaves, is used for a variety of culinary and medicinal purposes. It is rich in vitamins A, C, D and B complex, as well as iron, potassium and zinc. Dandelion salads taste delicious, and the slightly bitter leaf can be mixed with a variety of sauteed vegetables, especially winter veg. 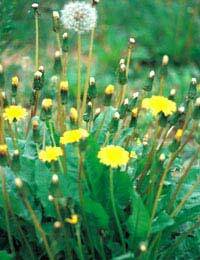 Dandelion wine has been popular for hundreds of years, and dandelion tea is used for a variety of medicinal purposes. Dandelion has historically used primarily to help with digestion problems, as an appetite stimulant, and to better liver, kidney and gallbladder function. It is also traditionally been used, especially in Chinese medicine, to help with female breast problems, including milk flow. According to some reports the plant can also help treat boils, eczema, blisters, burns and even warts and moles. Today, it is probably best known medicinally for its amazing leaves, which are often called into use as a natural diuretic. Dandelion as a very mild diuretic can have benefits, especially for conditions such as pre-menstrual tension, liver problems and high blood pressure. Compared with other diuretics, this natural supplement is rich in potassium, so it helps make up for the potassium lost by frequent urination as the kidneys strive to get rid of salt and water. Diuretic supplements can help cleanse the blood, helping the kidneys recycle nutrients. Better kidney function generally means better skin and overall health. With dandelion, it is usually the tough green leaves which are used to benefit the kidneys, while the roots detoxify the liver. Studies on mice have shown that when used as a natural diuretic, dandelion can have better effect than some prescription medicines. It also said that it works better than any other plants, including the juniper berry, as a diuretic, and also has anti-inflammatory properties. As of yet there is no data available concerning the diuretic effect of dandelion on human beings. Dandelion leaves: Warm up mug, sprinkle in two ounces fresh dandelion leaves. Pour boiling water into mug, let steep for up to 15 minutes. Add honey or sugar if desired. Recommendation: Sip one cup up to three times daily, hot or cold. Dandelion root: Take on dandelion root, slice into small pieces and squeeze a bit. Pour into one cup water in saucepan, bring to a boil. Gently simmer for up to 15 minutes, then pour into cup. Add honey or sugar if desired. Recommendation: drink one cup of this herbal brew thrice daily. Dandelion herb: Chop a dandelion herb and mix with one cup vodka. Cover and store for two weeks in cool area, shaking several times daily. Strain, then gently pour into sealed dark bottle. Recommendation: Mix tincture (10 – 15 drops) with cup of water thrice daily. Dandelion is considered a safe herbal supplement for the vast majority of people, although some may be allergic to this plant, which can result in mouth sores. As with any supplement, ask your doctor before taking as it can interfere with other supplements, as well as prescribed medication. People with gallbladder problems or gallstones should ask a medical professional before eating the dandelion flower or anything made from its leaves or roots. Rare side effects include diarrhoea and nausea.